From a distance it seems pebbles have been strewn around carelessly forming mounds. Coming closer, the huge loose granite boulders begin to take shape. Stretched among these precariously balanced boulders piled high, paddy fields glow in the morning sun. Coconut palms sway to the music of the breeze. 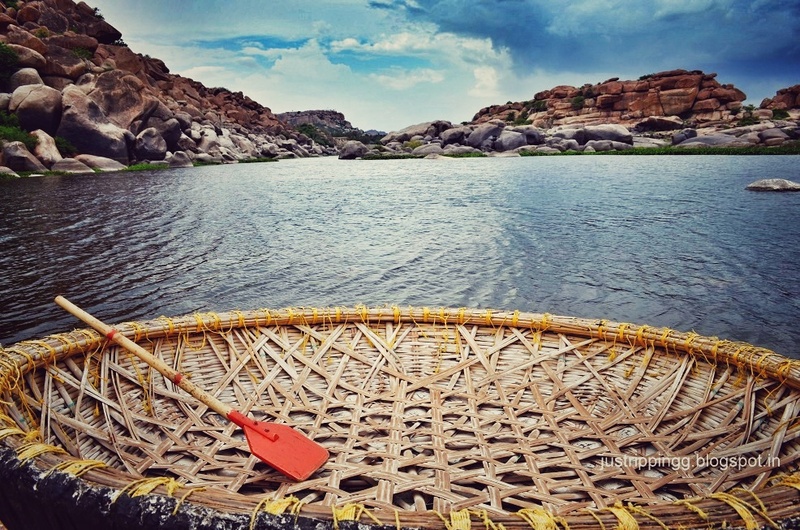 The sparkling Tungabhadra River flows serenely. High up, a lone mantapa perched on the side of the hill standing guard for centuries watches this scene dispassionately. 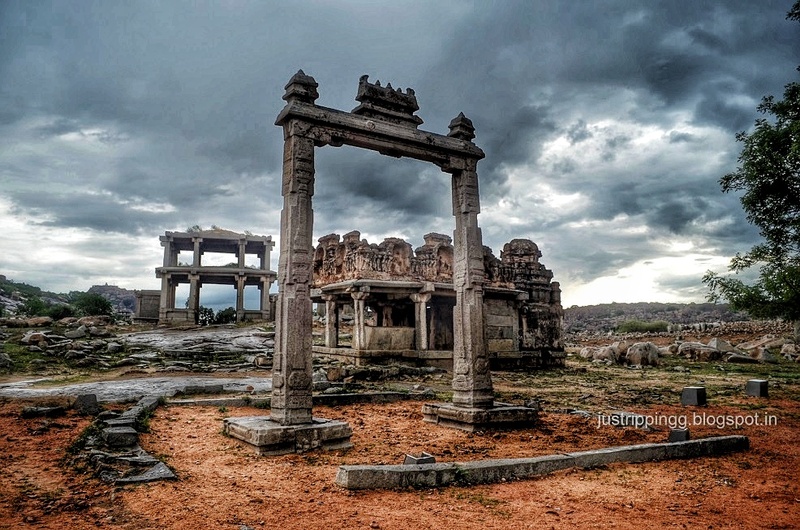 This is the hauntingly enchanting landscape of UNESCO World Heritage Site Hampi in Karnataka that witnessed the rise and downfall of one of the greatest Hindu Kingdom of Vijayanagara. 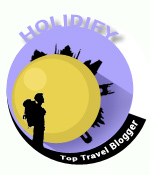 The love story that started few years ago has grown stronger over several visits. 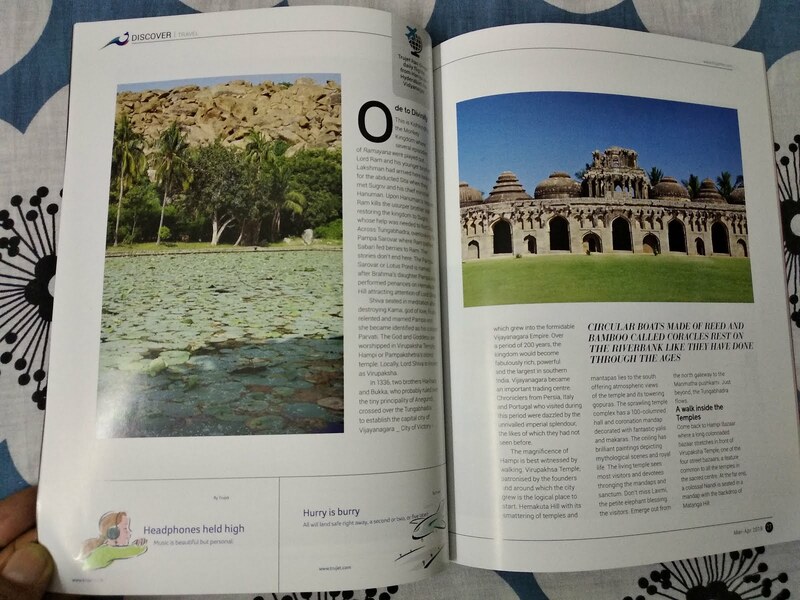 It was love at first sight with the austere and grandiose Hampi and now every visit is a joyous homecoming. The ochre boulders, the green banana plantations and the grey ruins seem to hold you into a lulling embrace filling your entire being with surging bliss. You want to see, feel and experience more of Hampi. 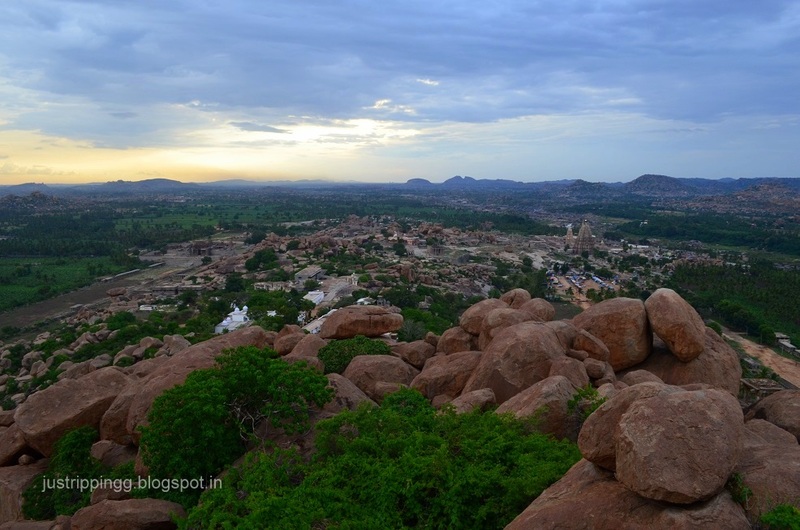 This is Kishkindha, the Monkey Kingdom where several episodes of Ramayana were played out. Ram & Lakshman had arrived here looking for the abducted Sita when they met Sugriv and his chief minister Hanuman. Upon Hanuman’s request, Ram kills the usurper brother Vali restoring the kingdom to Sugriv whose help was needed to find Sita. Across Tungabhadra, overlooking the Pampa Sarovar where Ram bathed, Sabari fed berries to Ram. The stories don’t end here. 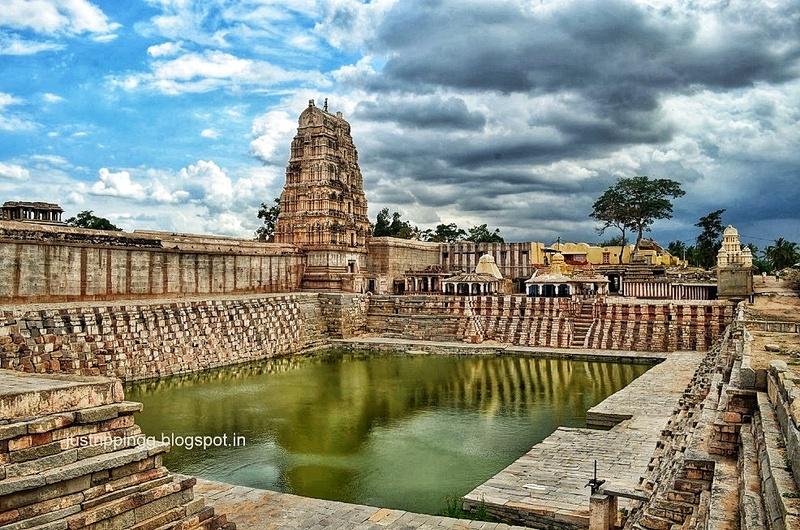 The Pampa Sarovar or Lotus Pond is named after Brahma’s daughter Pampa who performed penances on Hemakuta Hill attracting attention of Shiva. Shiva seated in meditation after destroying Kama, god of love, finally relented and married Pampa and she became identified as his consort Parvati. 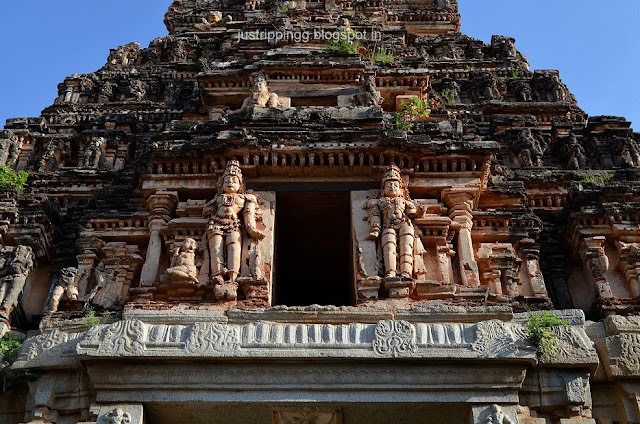 The God and Goddess are worshipped in Virupaksha Temple; Hampi or Pampakshetra’s oldest temple. 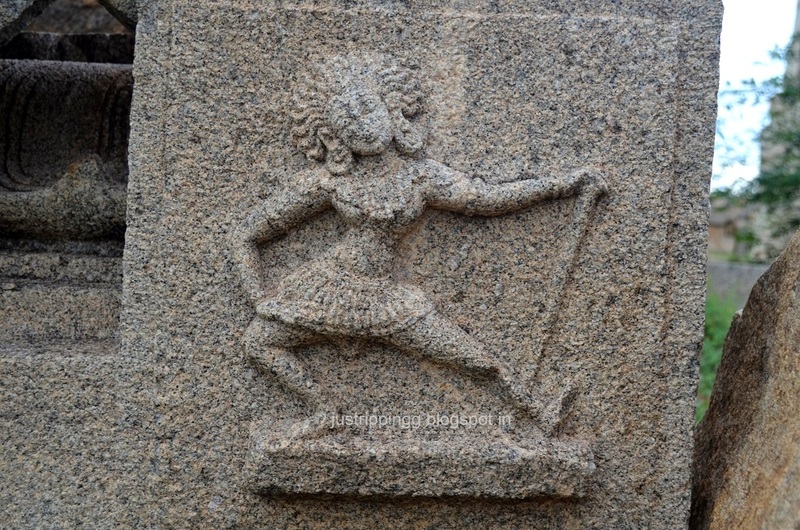 Locally, Shiva is known as Virupaksha. 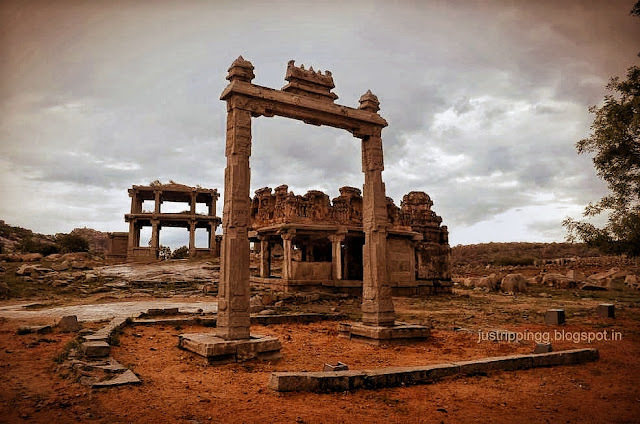 In 1336, two brothers Harihara and Bukka, who probably ruled over the tiny principality of Anegundi, crossed over the Tungabhadra to establish the capital city of Vijaynagara – City of Victory - which grew into the formidable Vijaynagara Empire. Over a period of 200 years, the kingdom would become fabulously rich, powerful and the largest in South India. Vijaynagara became an important trading centre. Chroniclers from Persia, Italy and Portugal who visited during this period were dazzled by the unrivalled imperial splendour, the likes of which they had not seen before. 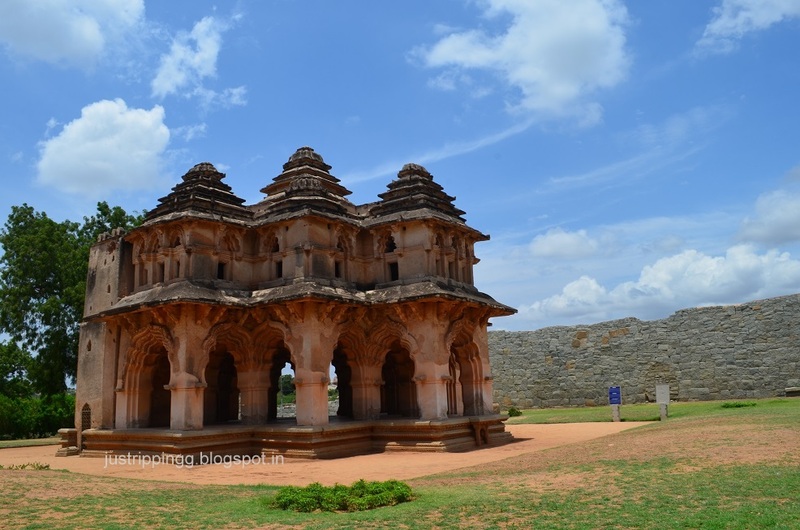 The magnificence of Hampi is best appreciated by walking. Virupakhsa Temple, patronized by the founders and around which the city grew is the logical place to start. Hemakuta Hill with its smattering of temples and mantapas lies to the south offering atmospheric views of the temple and its towering gopuras. The sprawling temple complex has a 100-columned hall and coronation mandap decorated with fantastic yalis and makaras. The ceiling has brilliant paintings depicting mythological scenes and royal life. The living temple sees the most visitors and devotees thronging the mandaps and sanctum. Don’t miss Laxmi, the petite elephant blessing the visitors. Emerge out from the north gateway to the Manmatha pushkarni. Just beyond the Tungabhadra flows. Come back to Hampi Bazaar where a long colonnaded bazaar stretches in front of Virupaksha Temple, one of the four street bazaars, a feature common to all the temples in the sacred centre. 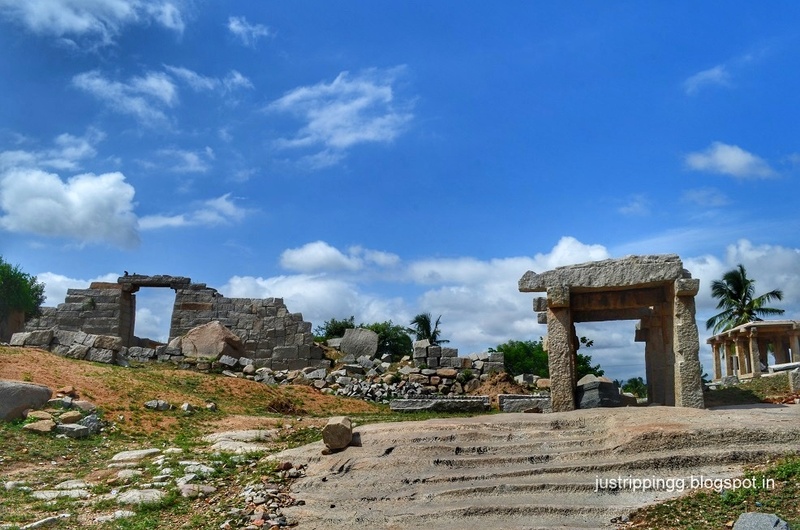 At the far end, a colossal Nandi is seated in a mandap with the backdrop of Matanga Hill. 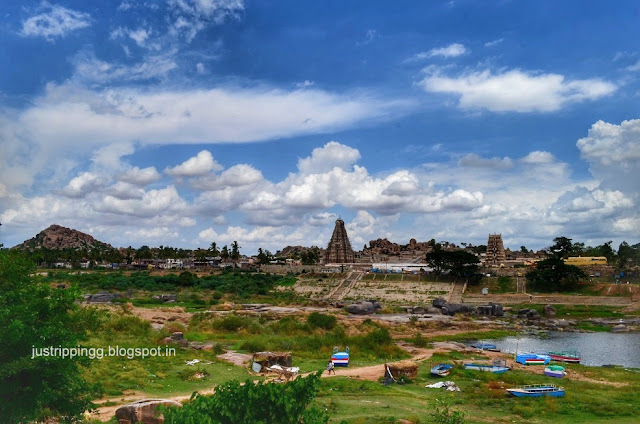 If you want to go back into time, turn left from Hampi Bazaar and walk along Tungabhadra with perhaps the most remarkable setting. Time seems to have stopped here. Devotees dressed like they did 700 years ago rest on the rocks at Chakratirtha, the holiest bathing spot, after paying obeisance at the Kodandrama Temple. Circular boats made of reed and bamboo called coracles rest on the riverbank like they have done through the ages. Sit with the devotees as you watch the tranquil waters flow through a gorge towards Anjanadri Hill, where Hanuman was born. 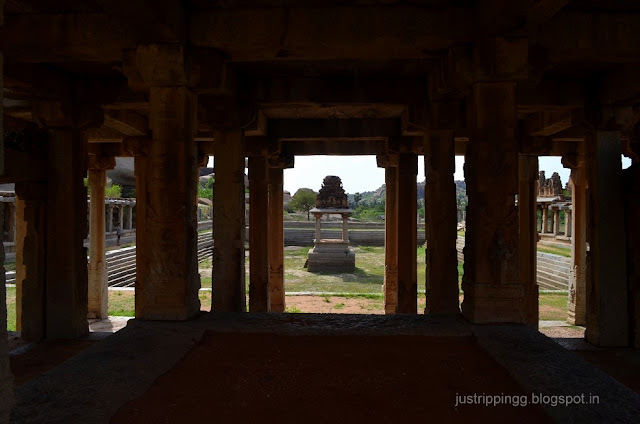 Hampi is a window where you can watch mythology, lost glory of Vijaynagar and the present in the same frame. Continue walking along the river, as you pass the Courtesan’s Street, another bazaar that leads to the third temple complex Achyutaraya Temple, until you reach a double storeyed pavilion like gateway with the King’s Balance next to it where the kings were weighed against gold and gems. 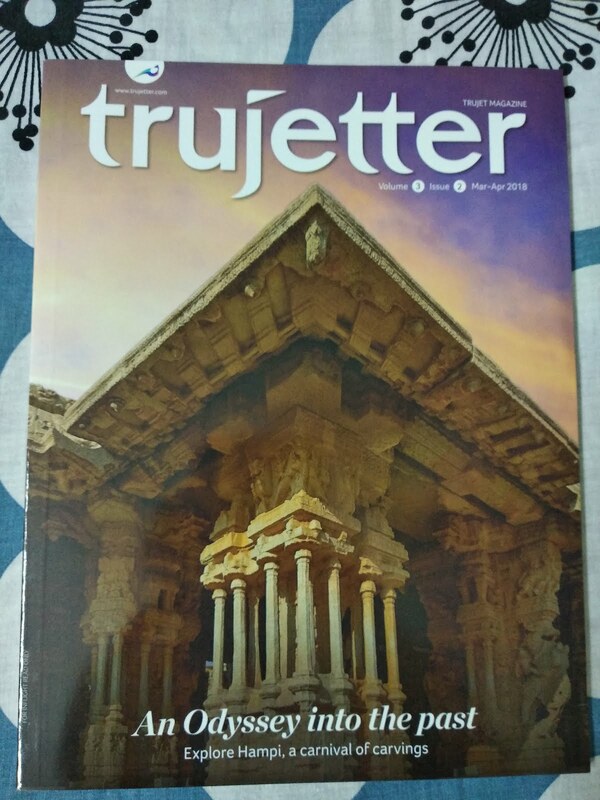 This brings you to the most ornate temple complex called Vitthal Temple. Here the iconic Garuda shrine in the form of wheeled chariot pulled by horses stands splendidly under blue skies. 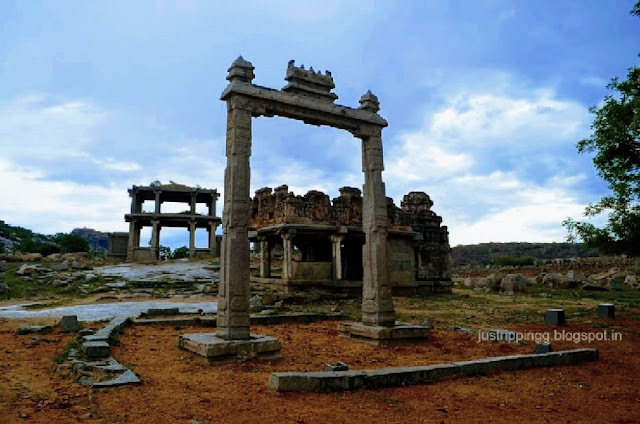 Hampi - Every visit to Hampi reveals more surprises. 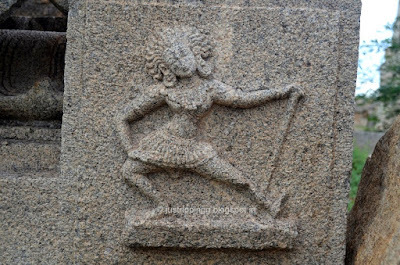 Here you meet the most enchanting and the prettiest woman in whole of Vijaynagar - what flair what verve and what a hairstyle - You are in love! But then all good things come to an end. The Deccan Sultanates to the North form a coalition. Vijaynagar army is routed in the Battle of Talikota in 1565. For next six months, the beautiful city is ravaged and pillaged. The ruined town is soon abandoned. The lively streets and bazaars that saw merchants from across the world trade gold, gems, ivory, brocade, silk and horses were soon overgrown and forgotten. The Royal Enclosure bore the brunt of the pillage that followed the doomed battle. Nothing survives except the beautiful unearthed pushkarni with elevated stone aqueducts and the massive three-tiered Mahanavami Dibba platform. During the nine days of Navaratri, the king sat on a gem studded throne on top witnessing the grand celebrations with dazzling display of wealth and power. Foreign chroniclers have left glowing accounts of the extravagant pomp and splendour. The high fortification walls bring you to Zenana Enclosure. Inside, the Lotus Mahal and the elephant stables with pointed arches, vaults and domes built in distinct Islamic architecture are apparently inspired by the contemporary neighbouring Bahmani Kingdom. 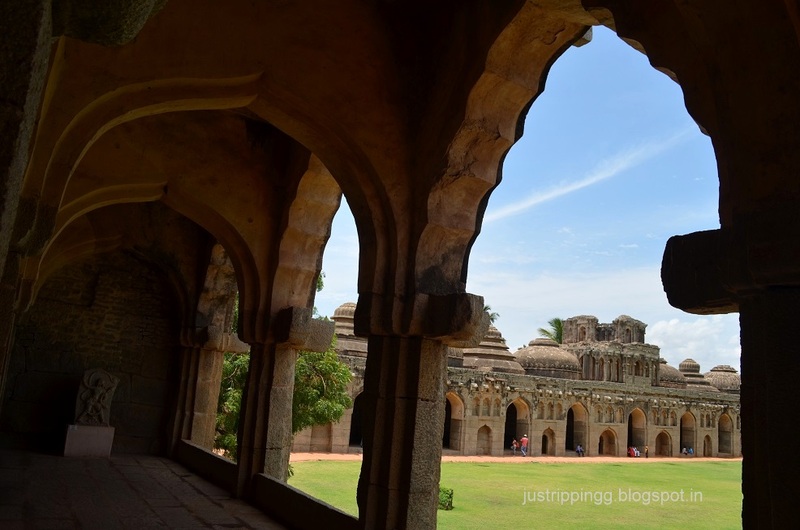 In fact, there is an entire Islamic Quarter near the Malyavanta Hill which points to cosmopolitan spirit of Vijayanagara. After a full day of exploring on foot, there is one last promise to keep. You are back at the entrance of Achyutaraya Temple. Unfrequented by the tourists, it is all quiet here. On the right rises the craggy Matanga Hill. 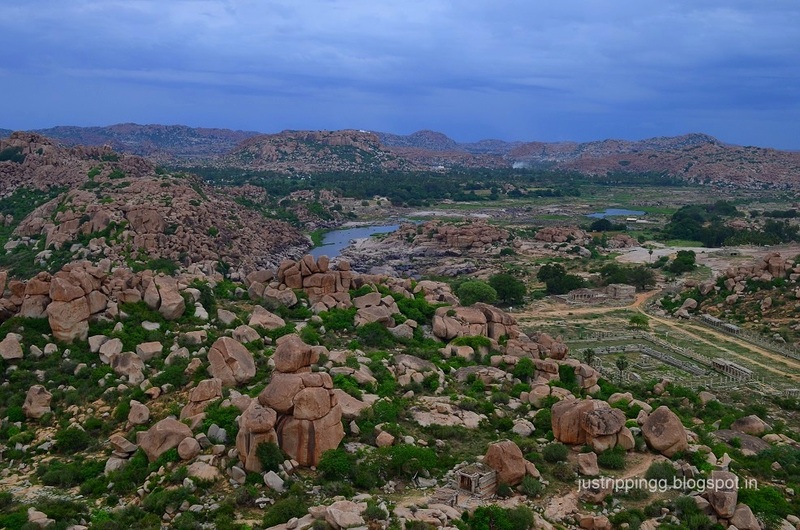 The rounded boulders have inexplicably arranged themselves to form the highest peak in Hampi. You have promised yourself that this time you will climb to the top for the breath-taking sunset views. 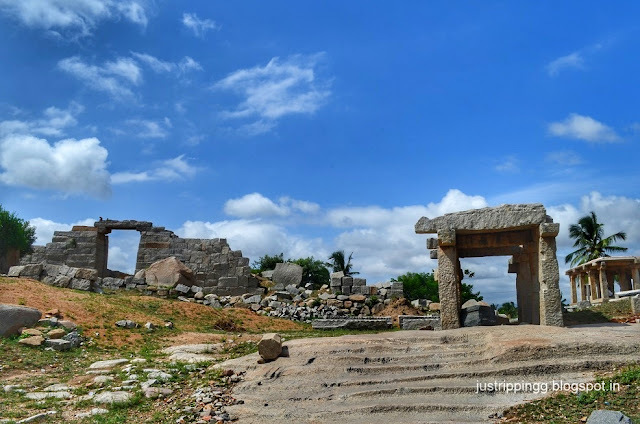 A passing shower has made the steep climb on the broken steps built during Vijayanagara times treacherous. With every step the views turn stunning. For the first time you get bird’s eye view of the most surreal landscape in the country - the same pebble like boulders, the patches of green and to the north the sliver of Tungabhadra. The Virupaksha Temple radiates golden aura under the setting sun. The prayers from the temple wafts up along with the cool breeze. The sky changes colour every minute. You want to savour every moment. This is your Promised Land. 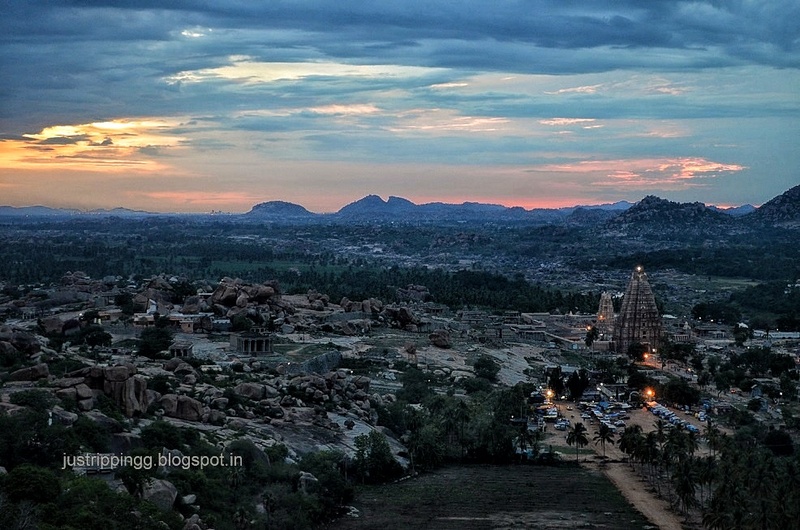 You just realise that not a day goes by when you don’t miss Hampi. It seems you have known each other for ages. The next time you will come for a longer visit. You want to spend more time with her. You feel her anguish. We will both sit holding hands looking into each other’s eyes. And then we will let the tears flow. We will cry together – at our ruins, at our fate and our lost glory. Pascal said, "When we see a natural style, we are astonished and delighted; for we expected to see an author, and we find a man." Yes, we found you, sitting right on the pages of your story, talking to us, sharing your experience, compassion and emotion. To the extent of making yourself vulnerable. 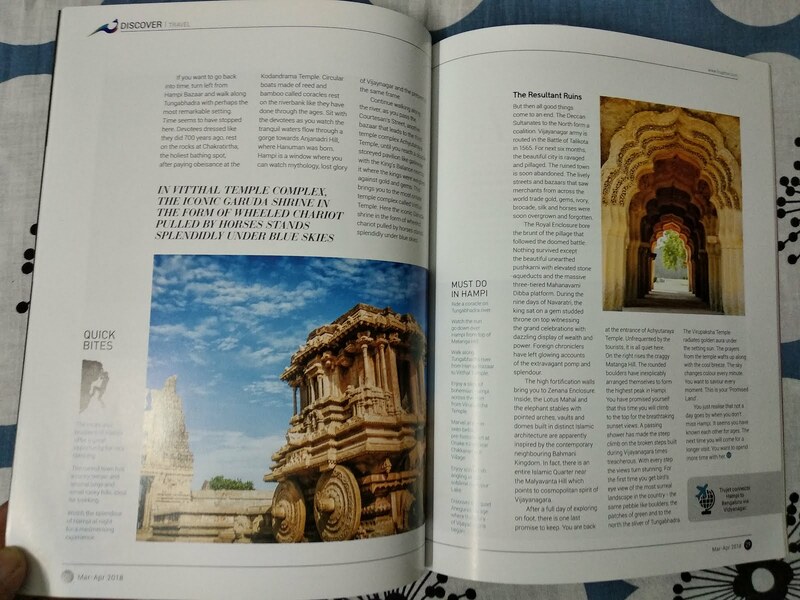 Your Hampi and Anegundi stories are always loved. The Epochal Love Story makes me love it all the more! There is a natural flow throughout the story with a pleasing rhythm, effortlessly connecting mythology, history and lost glory. The writing is subtle, sincere and insightful. 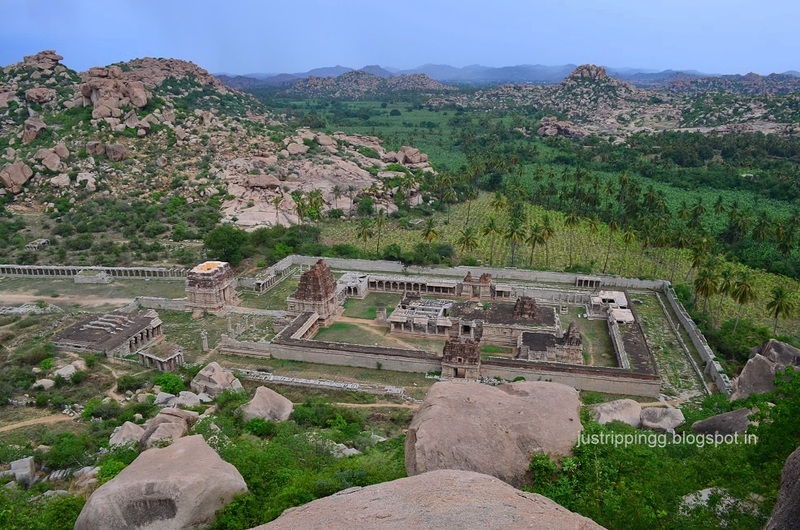 The eulogies to the grand Hampi landscapes make them materialize in front of the eyes, providing sweeping panoramas! The boulders, the mountains, the ruins and even the shallow waters of Tungabhadra seem to echo the epoch. 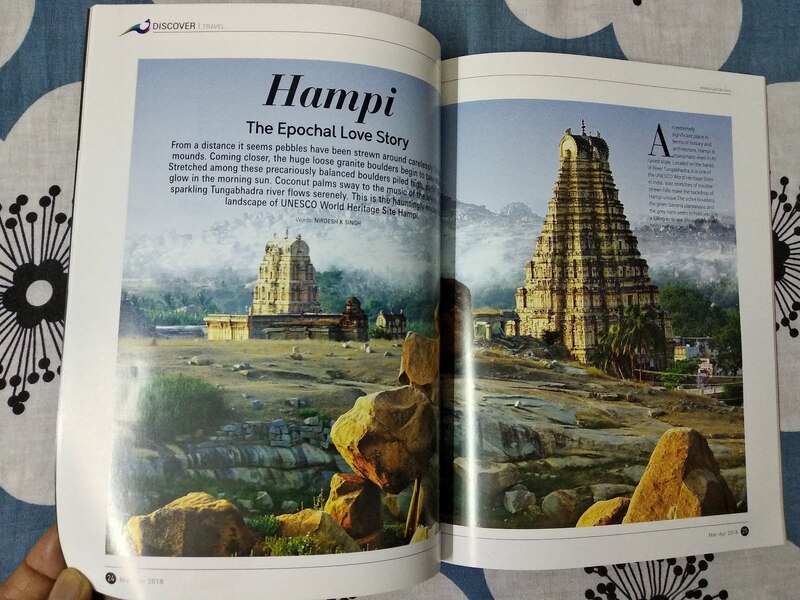 You love Hampi and she loves you back. There is nothing more beautiful than love returned. 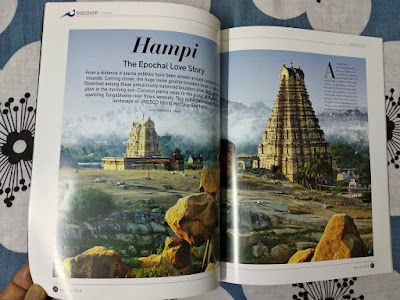 And so is Hampi The Epochal Love Story. I waited few days thinking what to write but then realised that no words will befit what you write.